With still over half of the bays opened in the Bonnet Carre Spillway and Mississippi River waters gushing into Lake Pontchartrain, Capt. 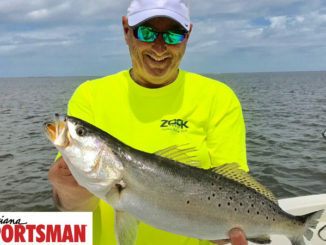 Chas Champagne was able to find a few speckled trout (this video was taken March 28)! He caught 7 on this day and 22 two days before that. “It’s tough but there’s a few,” he told the Sportsman.”It’s a ghost town out there. I’d be starving to death if we still owned a marina there.” Champagne previously owned Dockside Bait and Tackle which closed it’s doors in 2014. 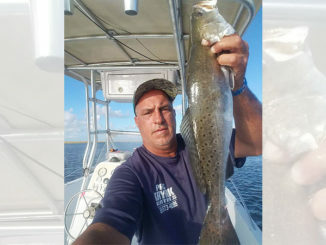 This avid angler and Sportsman’s go-to guy for Lake Pontchartrain fishing reports, lives in Slidell and fishes the north shore area of Lake Pontchartrain nearly every week. Besides running DockSide LA Guide Service on the lake’s north shore, Champagne makes Matrix Shad fishing lures and Golden Eye jig heads. 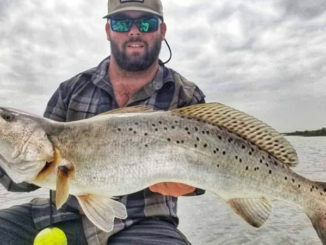 Will spillway openings hurt April trout bite?